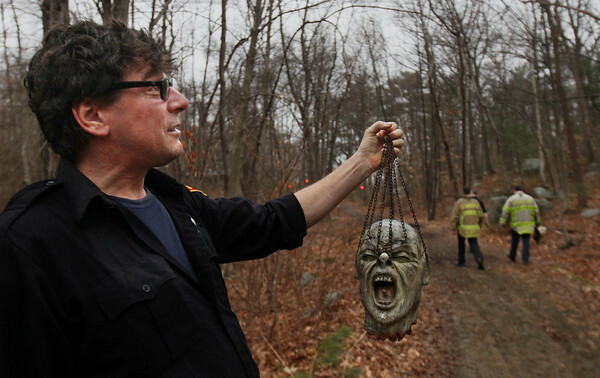 Gloucester firefighter Paul Serrin shows off a macabre discovery he made while fighting a brush fire Friday afternoon in the woods near Fernwood Lake: a Halloween decoration depicting a severed head. "It was ten feet up in a tree," said Serrin, "right in the middle of the fire area." As of mid-afternoon Friday, the fire department hadn't determined the cause of the blaze, which blackened several acres.